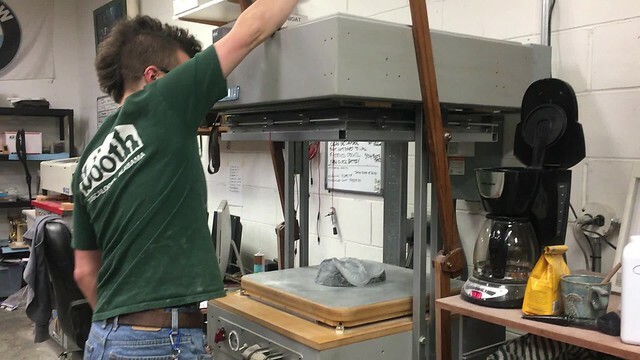 Alternate title: 3D printing for a vacuum former. 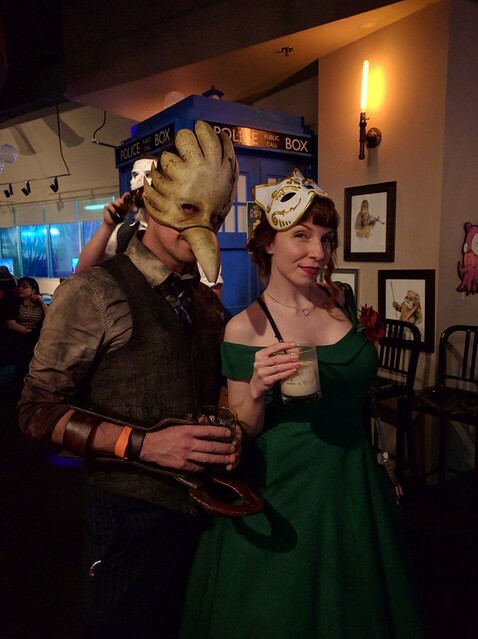 For New Years Eve 2016, our local gaming bar Battle and Brew threw a Rapture-themed party. 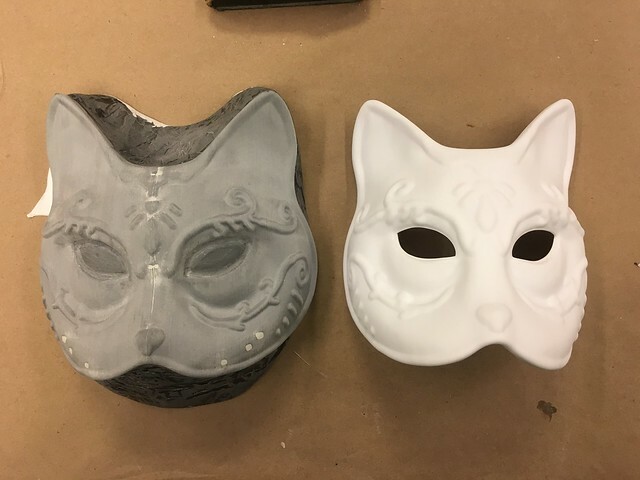 Maybe not the best theme considering the insanity that broke out there in 1959, but hey, good excuse to make some masks! 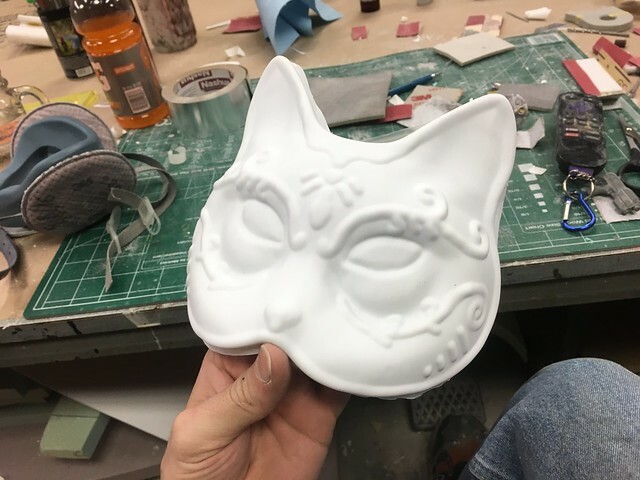 I made a Bird Splicer mask several years ago, designed to be vacuum formed in styrene for quick replication. Since completing that project I’ve made dozens more for other cosplayers but wanted to build something with my new robot assistants. 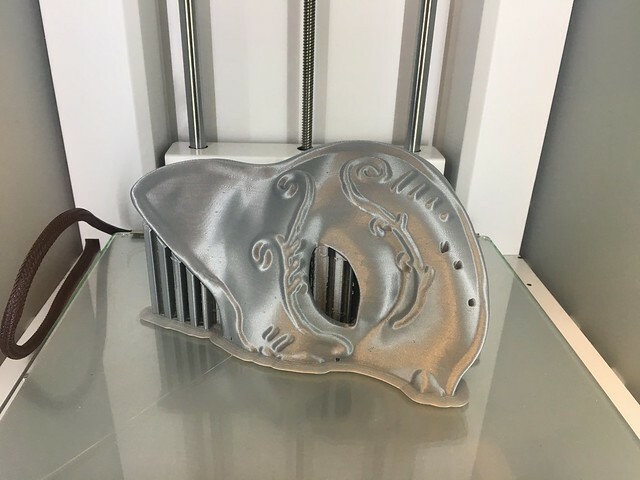 I found a 3D model on Thingiverse created by Annatar2, which you can download here! This was printed in two halves on two printers to save time. Print settings were: PLA. 0.6mm nozzle, 1.2mm walls, 25% infill, 0.15 layer height. Total print time for one half, about 15 hours. The large amount of support material was meant to help with making a draft, but I ended up snapping it off anyway. 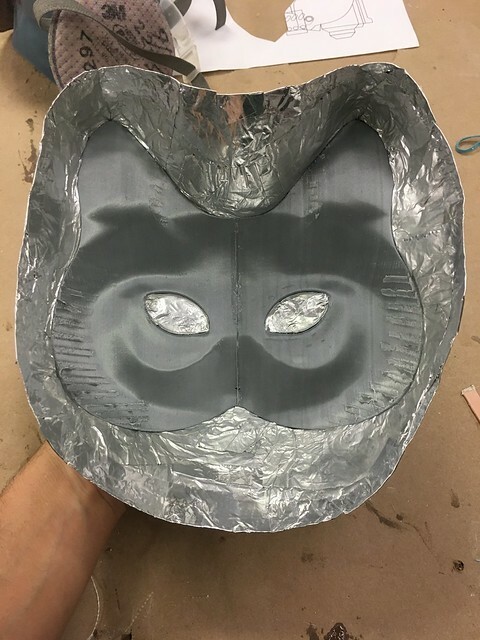 After trimming off the support material, a wall was made around the perimeter of the mask, using aluminum ducting tape. This will become the draft for the vac form buck later. 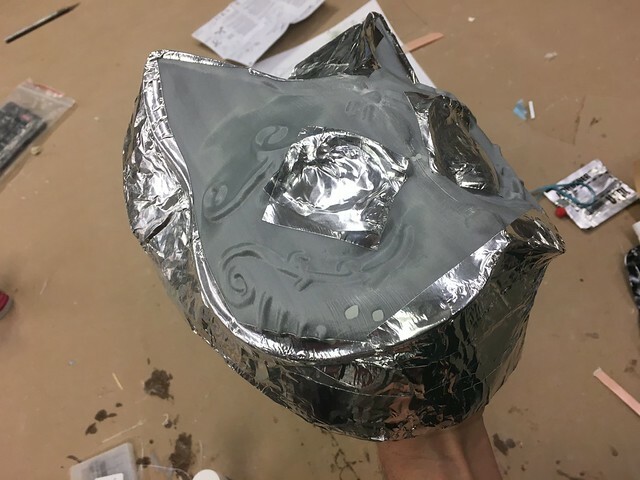 I also sealed the eye holes to make the whole mask enclosed. It’s really important to get a tight seal around the whole perimeter. Any gaps will cause the next step to fail in a very messy fashion. To create the draft, the hollow cavity would have to be solid. Filling this whole thing up with urethane resin would be expensive, and the added heat from the curing process might warp the PLA print. 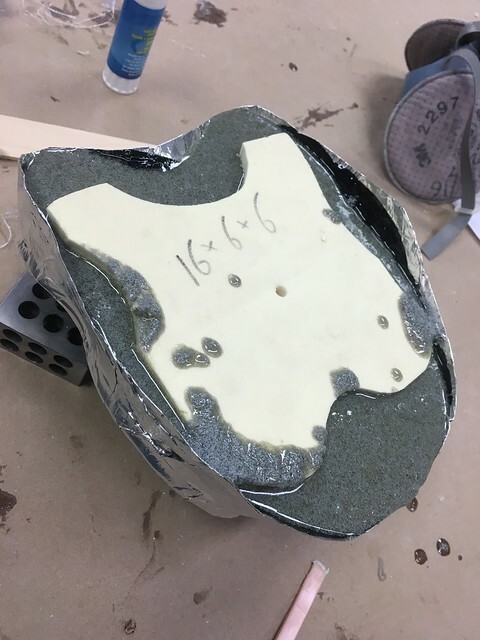 A chunk of 5# urethane tooling board was cut to rough shape and inserted into the mask, then the cavity was filled with SmoothCast Onyx and some scrap resin shavings as a bit more filler. All told this was still about 20oz of urethane. Once the resin cured, I could peel away the tape. There was a bit of bleed through in a few places which will need to be sanded off before vac forming. I’ll also clean up the edges to smooth out any bumps, making the buck easier to demold from the vacuum pull. You can also see here that the seam line needed just a little bit of bondo to smooth things out. 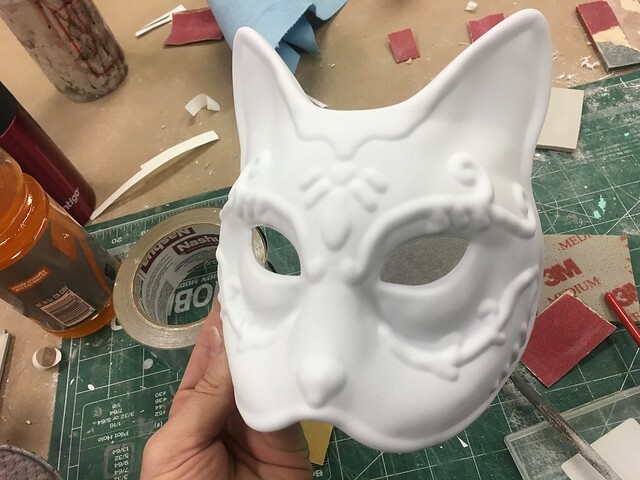 I filled in the whisker holes as well, as these wouldn’t be needed for the vac form copy. Eyes and perimeter draft were cleaned up with 80 grit sanding paper, and the edges of the eyes were defined a bit with a ball end engraving bit on my dremel. Most details will ge rounded off in a vac form pull, so sharp edges like the eye perimeter need to be exaggerated a bit. 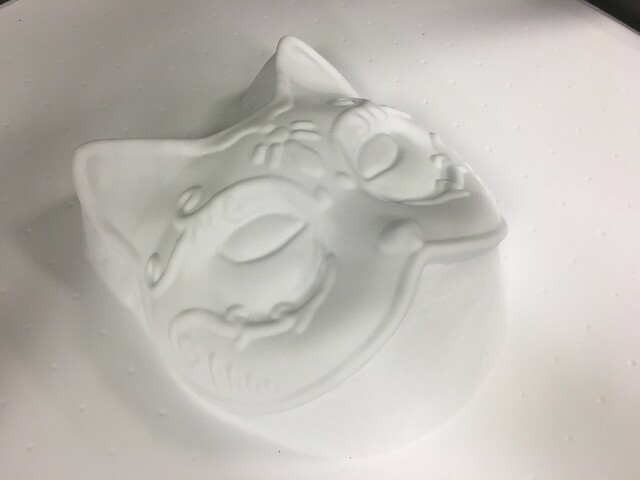 A quick dusting of powder and it’s ready for vac forming. 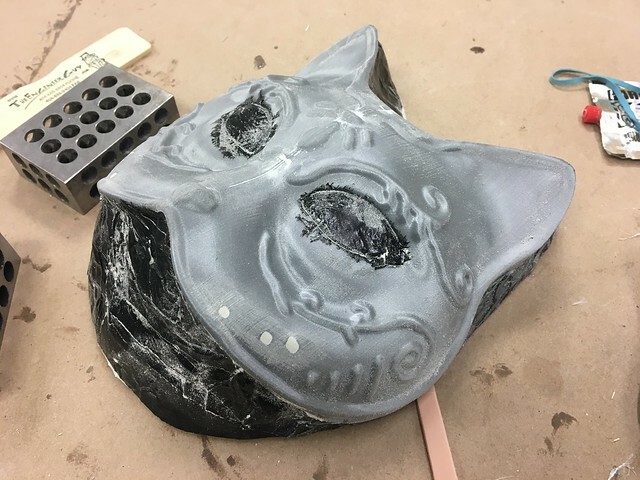 Mask puled in .060″ styrene. I made the plastic a bit cooler than some of my other pulls because I didn’t want to heat up the PLA too much. A second pull at a hotter temp turned out just fine though. I had absolutely no idea if this would destroy the print or not, but it made it through just fine! I think if I wanted this to be useful in the long term, I’d make a mold and cast a master buck in Ultracal. 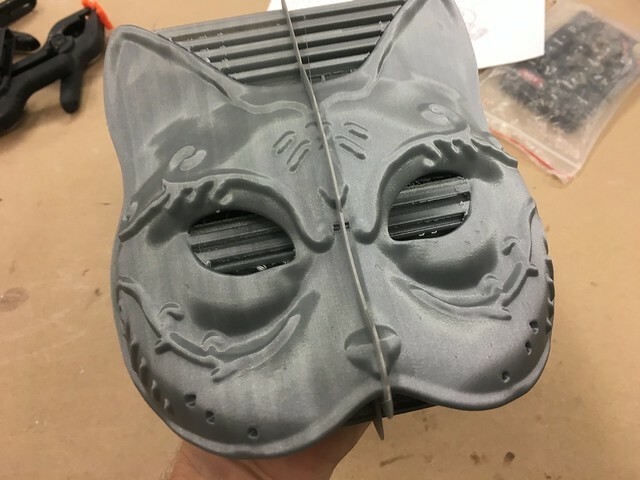 The lens perspective in this photo gives this a narrower look than it has in real life, but the printed/vac pulled mask turned out very flat and wide. 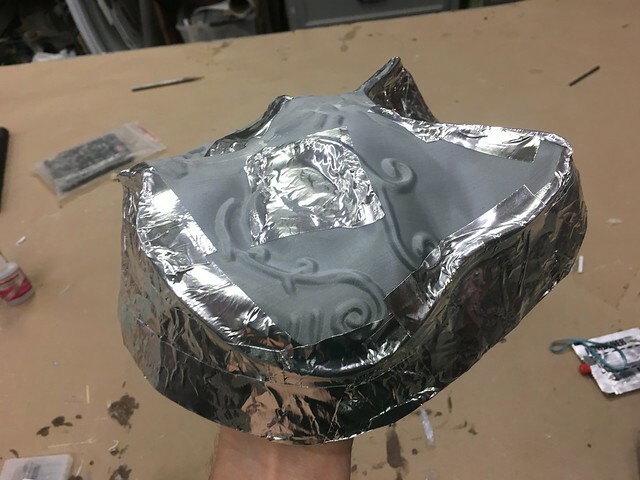 I heated the center section with a heat gun and pinched it in a bit for a more streamlined look, which also fits against a face a lot better. Emily didn’t want to wear her Little Sister costume so she put together a quick “Amazon Prime” Baby Jane costume, pre-1959 Rapture civil war. 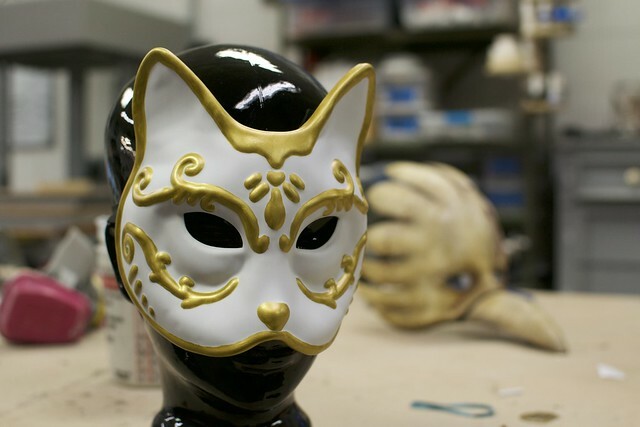 The cat mask was painted pretty clean and fresh looking to match, with a quick outline of urethane gold over the raised edges. I’ll be painting a proper crackled and weathered one of these in the future, but I’m really happy with this for a one-day build. 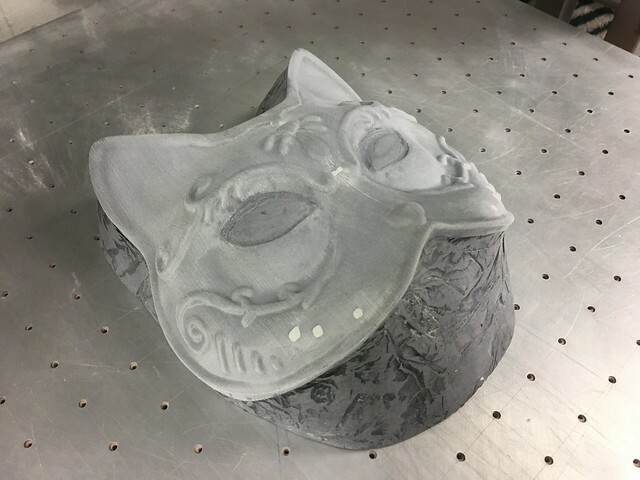 Thanks for reading, and good luck printing for vac forming!